JTG -- a self-professed Gaga fanatic -- tells TMZ, he went on Craigslist.com and successfully tracked down and purchased two $125 tickets to Lady G's sold out Wednesday night show in L.A. But when he showed up to the Staples Center, the ticket lady refused to accept them ... because they were fake. Now JTG is on the rampage, desperately trying to track down the scumbag who swindled him -- but first, he wants to make sure the bad guy gets the respect he deserves. The wrestler tells TMZ, "Game recognize game, so I gotta respect his hustle. But when I catch him, I hope he can respect my Brooklyn-style beatdown." 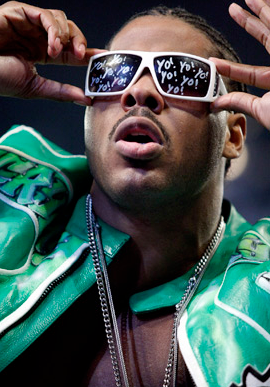 JTG says he's been power dialing the Craigslist con artist ever since ... but it keeps going straight to voicemail.